Your father was a space miner and his father before him and his father before him, and so on. What I’m saying is that you’ve kind of got a long lineage of people drilling into alien worlds for minerals and resources. You’ve come to Mars to prove yourself the best driller around. At least, that’s the story I created for myself before sitting down to play the video game turned board game Super Motherload. This is a deck builder, but not like Dominion or Star Realms. This game comes with a board. Not a superficial one that is there just to help you place cards. This board is as essential, maybe more so, than the deck you’ll build. And that’s what helps Super Motherload stand out. It’s certainly unique, even if it has some flaws. Your goal is to drill and bomb your way through the layers of Mars, collecting minerals, bonus bomb tokens, and uncovering alien artifacts. You start with a weak assortment of cards, but like most deck builders, there’s a marketplace to buy better cards. There are four types of cards: red, blue, yellow, and rainbow (wildcard). To drill, you play any number of the same color (plus wildcards), count up the drill icons in the upper left of the cards and that’s how many spaces you can drill on the board. Any items you drill over on the board you collect. Minerals (worth $$$) are then placed on the cards in your marketplace. Once you’ve placed enough to meet or exceed the marketplace card’s cost, you can add it to your deck. 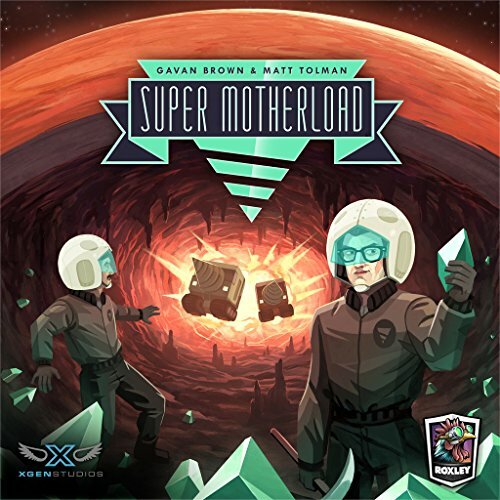 That’s interesting, but if that were all there was to Super Motherload, it wouldn’t be a particularly compelling game. And there is a bit more complexity. You can’t drill through everything on the board. There are rocks that can only be bombed using red cards. There are also steel plates on the board which can only be drilled by cards that match their colored outline. As you and your competitors uncover alien artifacts, you add new tiles, allowing you to explore deeper into the Martian surface. After the final artifact in the fourth layer of Mars is discovered, the game ends and everyone counts up their Victory Points. The winner is declared Mars’ greatest driller. I like Super Motherload. It’s different. The use of the board mixed with deck building is clever, but there’s little if any emphasis on optimizing your deck. You just want to buy and buy and buy as many cards as you can. They all help. And, in fact, some higher cost cards, acquired towards the end of the game, can be difficult to place when the board is overcrowded with different types of material. A giant bomb spread would be great early on, but on the fourth layer, there are lots of spaces that cannot be bombed, negating some of these cards’ usefulness. In fact, I had just as easy a time using the starter cards (with a single drill icon) as the most expensive cards. That’s hardly the mark of a great deck builder. Then again, Super Motherload isn’t just about building a deck. As long as you aren’t going into it expecting the next Dominion or Marvel Legendary, you’ll probably be satisfied. Look at all my Super Motherload victory points! The different factions have their own personas. Lots of opportunities to strategize and optimize your turns. Easy for anyone with analysis paralysis to get hung up and take very long turns. Might not even be possible to create an optimal deck. Lasts longer than it should. You want a different kind of deck builder. You like taking your time to plot your next move. You want a light game that isn’t over quickly. Dog and Thimble received a promotional copy of this game for review.